Attractive wall art framed lyrics design of “Since I’Ve Been Loving You” -Led Zeppelin. All our frames are British made, solid oak, stained black wood, stained white wood, two-tone silver (in high grade plastic,) Shabby Chic (high grade plastic,) Luxury Ornate Silver (Silver Dahlia in wood and plaster.) See product gallery images for examples of the frames. Our prints are produced on a fine art quality printer with archival non-fade inks on thick stock gloss paper. This item dispatches in 24 hours. Please make frame selection before going to checkout. Glass is replaced with acrylic to ensure safe transit to you. Choose from A3 and A2 sizes, please bear in mind that those are the sizes of the print and therefore the overall size including the frame is slightly larger. Attractive wall art framed lyrics design of “Stairway To Heaven” – Led Zepplin. All our frames are British made, solid oak, stained black wood, stained white wood, two-tone silver (in high grade plastic,) Shabby Chic (high grade plastic,) Luxury Ornate Silver (Silver Dahlia in wood and plaster.) See product gallery images for examples of the frames. Our prints are produced on a fine art quality printer with archival non-fade inks on thick stock gloss paper. This item dispatches in 24 hours. Please make frame selection before going to checkout. Glass is replaced with acrylic to ensure safe transit to you. Choose from A3 and A2 sizes, please bear in mind that those are the sizes of the print and therefore the overall size including the frame is slightly larger. Attractive wall art framed lyrics design of “Thank You” – Led Zeppelin. All our frames are British made, solid oak, stained black wood, stained white wood, two-tone silver (in high grade plastic,) Shabby Chic (high grade plastic,) Luxury Ornate Silver (Silver Dahlia in wood and plaster.) See product gallery images for examples of the frames. Our prints are produced on a fine art quality printer with archival non-fade inks on thick stock gloss paper. This item dispatches in 24 hours. Please make frame selection before going to checkout. Glass is replaced with acrylic to ensure safe transit to you. Choose from A3 and A2 sizes, please bear in mind that those are the sizes of the print and therefore the overall size including the frame is slightly larger. 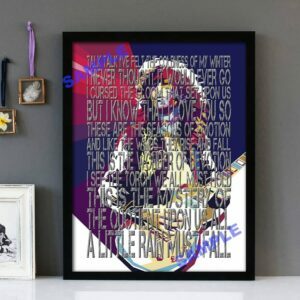 Attractive wall art framed lyrics design of “The Rain Song” Led Zeppelin. All our frames are British made, solid oak, stained black wood, stained white wood, two-tone silver (in high grade plastic,) Shabby Chic (high grade plastic,) Luxury Ornate Silver (Silver Dahlia in wood and plaster.) See product gallery images for examples of the frames. Our prints are produced on a fine art quality printer with archival non-fade inks on thick stock gloss paper. This item dispatches in 24 hours. Please make frame selection before going to checkout. Glass is replaced with acrylic to ensure safe transit to you. Choose from A3 and A2 sizes, please bear in mind that those are the sizes of the print and therefore the overall size including the frame is slightly larger.